CARSONIA: Voyager 1 in Interstellar Space? Has Elvis Left the Solar System? Voyager 1 in Interstellar Space? Has Elvis Left the Solar System? Has Elvis left the Solar System? Voyager 1 is about to make history for humanity as it has most likely left our solar system and is now in interstellar space. This isn't just exciting, it's TREMENDOUSLY EXCITING and HISTORIC for the human race! I myself am an incurable fan of both Voyagers and this post is to share some very recent info about them and also to review the basics for those who may not be familiar with the mission. 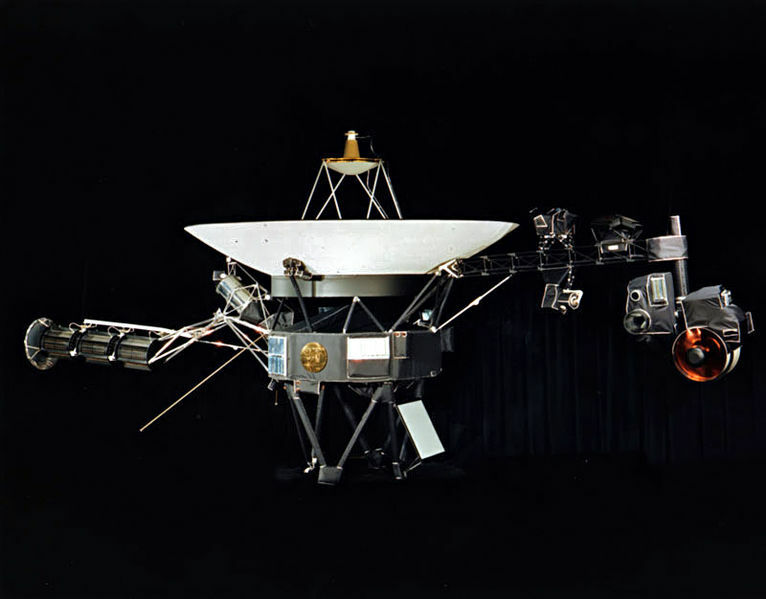 Below (public domain image), is the Voyager 1 spacecraft. 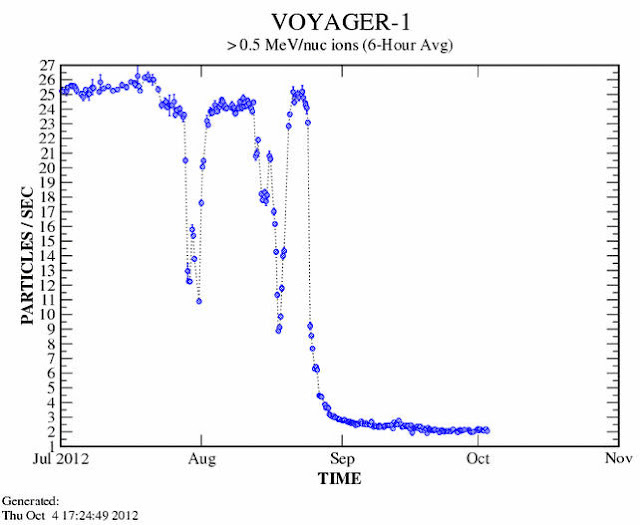 Houston Chronicle Post: http://blog.chron.com/sciguy/2012/10/more-evidence-that-voyager-has-exited-the-solar-system/ by Eric Berger. To me, the most exciting portion of Mr. Berger's post is the second chart (posted below) which shows a massive drop and continuous lowered amount of ionized particles from our Sun. The actual boundary crossing could have happened as evidenced by that and the raised level of highly energetic galactic cosmic rays the prob is reading. Those have been on the rise for a while. Another aspect to consider is the flux of the magnetic field. All these are elements have effectively been observed during the past few months. No one knows the exact boundary of our solar system........yet! Isn't that amazing?! What does our membrane look like? How permeable is it? Is it degrading? How much does the boundary shift and does it shift with our sun's wobble or with our system's wobble in and out of the arm? I'm looking forward to hearing some of those answers one day and hope that it will be in my lifetime. I personally imagine the boundary to be rather vague in spots and constantly shifting in minute details. 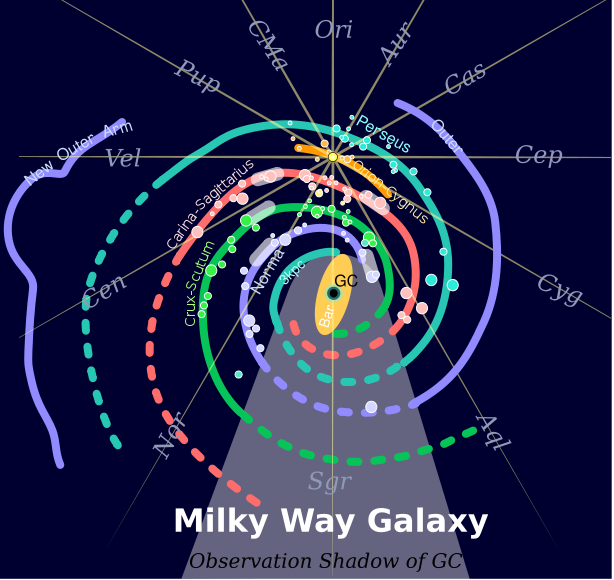 An interesting thing to remember is that Voyager 1 and Voyager 2 are at different places so while similar shifts are expected, we might have something striking from one that the other doesn't find.﻿ In Berger's article, you'll see more charts and criteria for Voyager to be considered "out" of our solar system. Quote: "At last check, NASA scientists said they were not yet ready to officially declare that Voyager 1 had officially exited the solar system by crossing the heliopause. 2. A drop in charged particles emanating from the sun. 3. A change in the direction of the magnetic field. and no spacecraft have gone before! There are a great many people who don't get how fantastic that is. They have been somewhat dulled to a host of real scientific discoveries due to their less "flashy" nature when put up against Star Trek, Star Wars, and recent decades of space and sci-fi special effects and computer-generated environments. Adventures of slow-spinning, silent, old technology spacecrafts often get a bit forgotten by those not actively looking right at the space community and those researchers. How long will the Voyagers last? How far can they go? http://voyager.jpl.nasa.gov/science/thirty.html From the timeline, it looks as if Voyager 1 is expected to live slightly longer than its sister Voyager 2. Having followed the Voyager probe missions since I was a child and being inspired by watching Carl Sagan in Cosmos: A Personal Voyage on TV in the 80's, I have always been fascinated with space and any aspect of the night sky. 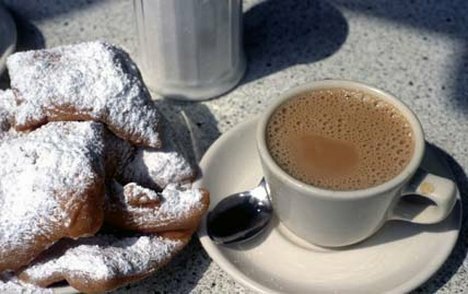 Humanity has always looked up and in spite of the terribly too-bright skies over New Orleans, I am always looking up. One day, hopefully sooner rather than later, I hope to purchase a telescope. 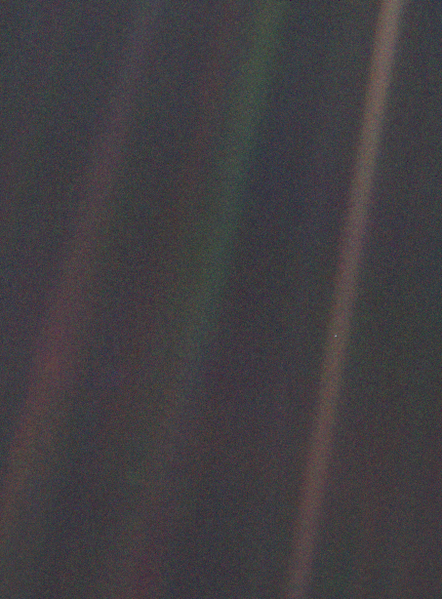 Here is one of my favorite pictures of all time:The Pale Blue Dot references a picture taken of Earth from Voyager 1 in 1990 from 6 billion km away. 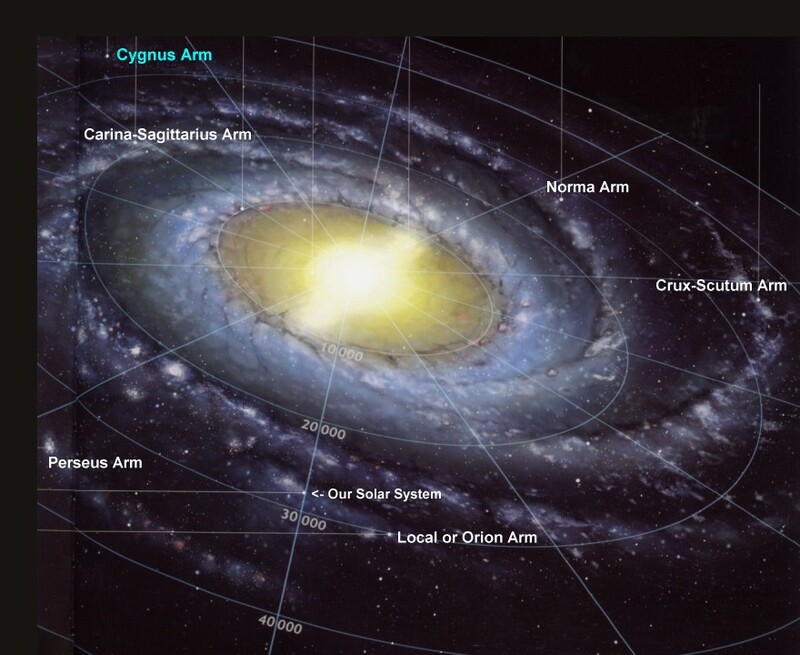 It shows how small we are and lends perspective on our place in the local cosmos. It transfixes me. Every time I hear Sagan's voice reading the famous passage from his Pale Blue Dot: A Vision of the Human Future in Space, my eyes fill with tears and I am overcome with emotions and inspiration. If you look closely, you can see Earth in the brown band on the right, about halfway up. That is our planet. Stunning isn't it! Check out the Pale Blue Dot link above for a look at the wide angle shot which includes our sun. 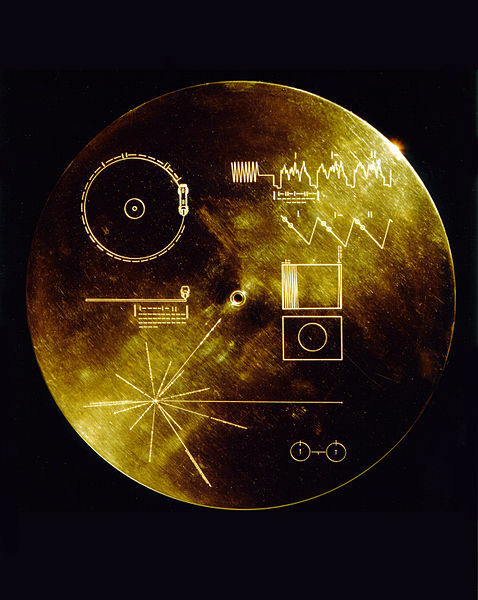 Being musician, I am also thrilled about the Golden Record being aboard Voyager 1 and 2. It was intended to represent our world and its civilizations. Can you imagine that if something happened to Earth and the planets on and around which we have robotic spacecraft, this would be THE ONLY EVIDENCE of our existence! I do actually ponder that from time to time.The Golden Record contains scenes, greetings, music, and sounds from Earth. What would your selections be? Here is a link to all of the information on the records. If you ever get the chance to check out Murmurs of Earth by Carl Sagan, take advantage of it.